GENERAL Education Permanent Secretary, Jobbicks Kalumba has promoted Chisanga Chilala, a teacher of Kifubwa Primary School in Solwezi. The teacher, who has been babysitting one of her pupils’ sibling, while conducting lessons, has been promoted to the position of Deputy Headteacher. 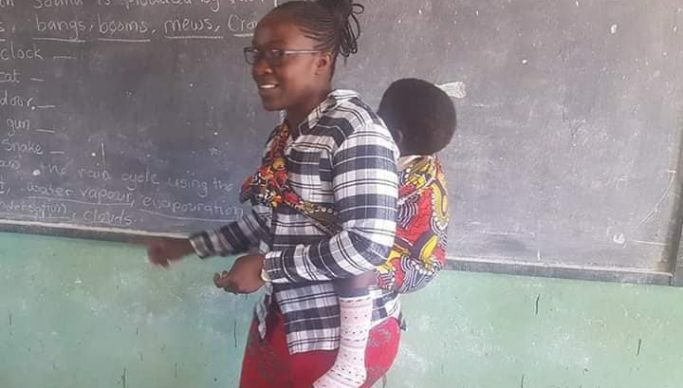 This comes barely 5 months, after pictures of Chilala went viral on social media, where she is depicted teaching with a baby on her back. Kalumba said such productive and caring teachers must be motivated because they fulfill a teacher’s commitment of serving the interest of the learner. And North Western Province Permanent Secretary Willies Mangimela has commended the Ministry of General Education for recognizing Chilala for her dedication to her work. Mangimela said that the gesture by the ministry will encourage other teachers to work hard in their delivery of service in the education sector. He has also encouraged other teachers to take keen interest in the affairs of their pupils as demonstrated by Chilala.